Really, it’s a bit late to be getting ready for winter, but on the basis of ‘better late than never’ here are a few tips that might help should the vagaries of the British weather throw more winter storms at us. a. Check gutters and drains – autumn leaves and debris can build up and prevent the efficient drainage of water. If water overflows from a blocked gutter it will soak through walls and can damage interior decorations. This is a simple maintenance task, although extreme care should be taken when working at heights. b. Paving, decking and general garden clutter – the base of the walls of your home should be kept clear of any obstructions that could compromise the damp proof course or block any air bricks (which are needed to ensure suspended timber floors are kept well ventilated to help avoid moisture build up which can trigger rot and insect attack). If a patio or deck has been built incorrectly then this may be a job that needs a bit more planning and possibly requires a local builder or landscaper. But simple DIY tasks can include things such as: clearing back soil in flower beds that have got too deep; removing stored clutter that could allow water to ‘wick’ into the wall; and checking for those evil leaves again. And while in the garden, if there are any loose fence panels, it is worth securing these in case of high winds and checking that any tree branches are sound. If a tree looks a bit suspect, a tree surgeon can advise on the correct measures to take. c. Roofs and chimneys – if you can see slipped or cracked tiles or slates from the ground level (or indeed from inside the roof space) then it would be prudent to get them repaired/replaced by a roofing contractor. Also if there is cracked or broken mortar at the verge (edge of the roof) it may be worth considering repairing this at the same time. Water can get in through the tiniest of cracks and if you are paying for scaffolding or a cherry picker to access the roof safely then it is worth doing as much as possible. Also, the flashing at the base of the chimney pot or, in terraced houses with different roof levels, at the junction with a neighbouring wall may also need attention. And finally, do not forget about valley gutters (often hidden between two gabled roofs and quite common in houses from the Georgian and Victorian period) and parapet walls. It is amazing how much debris can accumulate, and if it builds up it can allow water to get under the tiles or slates. In severe examples this has lead to water running down internal walls and has required the replacement of bedroom ceilings. d. Walls – if the pointing (the mortar finish between bricks or stones) is defective and cracking, then it might be prudent to consider re-pointing the wall. Frost can add to the damage and water can get in between the bricks. If you have an older stone built building it might be worth checking that the pointing is appropriate for the stone. There are many properties near us here in Northamptonshire where the soft stone has taken the brunt of the winter frosts because of the pointing. e. Relaying paths and decks – to ensure water is kept away from the home and air-bricks are not blocked up. Once you have dealt with the outside, then the next thing is to keep the warmth you do generate in. The first rule of keeping the warmth in is ‘insulate, insulate, insulate’. And if you have unfilled cavity walls, then this is certainly worth considering, but that isn’t a quick fix or a DIY job. a. Keep draughts at bay – refitting old windows isn’t a quick fix, but in the short term other things can be done. Secondary glazing can help eliminate draughts, sealant can be put around frames and thick curtains can make a real difference. If you have an open fire place (that you don’t use) then a chimney balloon is easily installed and can make a real difference to a room. Letter boxes can be improved by fitting a cover and you could consider blocking up the cat flap! If you have an older house with wooden floors, then you might find that the simple addition of a rug or carpet will keep the draughts from whistling up between the floor boards. b. 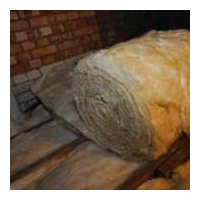 Insulation – loft insulation can be a DIY job (materials are readily available at DIY stores) and if your loft is not insulated to the recommended Loft insulationminimum this is worth doing. There are issues you need to consider when laying loft insulation (your health and safety, dealing with electricity cables and downlights etc.) but there is good advice readily available from the manufacturers or DIY stores. Another thing to insulate will be the hot water tank, if you have one, and the pipes. Insulating your hot water cylinder is one of the easiest ways to save energy and, money. The jacket around your tank should be at least 75mm thick. Fitting a British Standard jacket around your cylinder will cut heat loss by more than 75 per cent and, according to the Energy Savings Trust, could save you approximately £20-£35 a year. Insulating exposed hot water pipes will help keep hot water hotter for longer. This is an easy DIY job if the pipes are accessible; if your pipes are harder to reach, you may need professional help. And also remember cold water pipes. If there is a big freeze this winter, exposed cold water pipes could freeze up. As well as the inconvenience there is also the risk of burst pipes which can do a huge amount of damage. This applies to both internal and external pipes if they are exposed to the air. a. Service your boiler – as with a car, a serviced boiler will be a more efficient boiler and a heating engineer can check whether features such as the external condensate pipe in condensing boilers are in danger of freezing up. Also, ensure the thermostat is in a sensible place in order to control the boiler (there is no point positioning it in the coldest place in the house!). b. Put reflective foil behind any radiators positioned on outside walls. c. Bleed the radiators – as well as preventing knocking this will help maintain the life of the pump. d. If possible, don’t run the boiler all day – set the timer and the room thermostat. And finally, don’t forget to ventilate – we generate a lot of moisture in our homes, and if we don’t eliminate it the problems can be as bad as moisture getting in. Where possible, keep the generation of moisture down; put lids on pans when cooking, don’t dry clothes over radiators. Extractor fans, particularly with heat exchange units, can be fitted fairly easily. In sealed, modern homes this can be a real problem. Keep warm and dry this winter.